Mobile Texting is the most effective advertising channel today! Join thousands of successful businesses leveraging the hottest new trend in marketing: multi-channel marketing. With Blue Eye Group, the power of mobile marketing is already integrated into All-In-One Service so that you don’t have to manage separate, uncoordinated email and mobile marketing services. Manage all your customer contact databases at one place with Blue Eye Group. 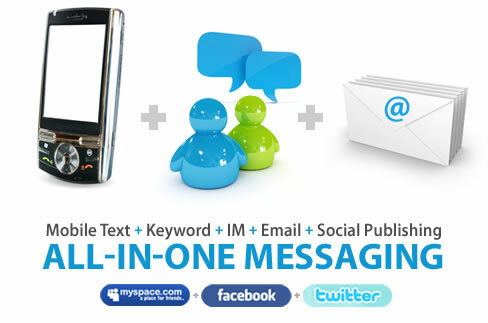 For about the same price you pay now for either mass emailing or texting, you can effectively send coordinated messages via every popular mode of communication (Mobile Text, Instant Message, and Email) using a single integrated database and messaging service. Mobile Keyword technology is bundled-in for FREE allowing you to join the ranks of large companies like American Idol™ so that you can enjoy the unprecedented benefits of Mobile Marketing. Upgrade to Blue Eye Group to utilize all of the advanced technologies that were only available to large companies in the past, but now available to you at a fraction of the cost. Increase response rates, brand awareness, and return on investment using a single web-based software that integrates every popular messaging channel. For the same price others charge for just email or mobile marketing alone, you can upgrade to a service that integrates it ALL. You see Mobile Keywords all over TV, radio, magazines, and Fortune 500 websites. People text your Keyword to your short code to join your mobile list. You can then send direct response campaigns for promotions, coupons, sales alerts, and important news!